This magnificent superyacht is an extraordinary development from the working dhows of the Indian Ocean. 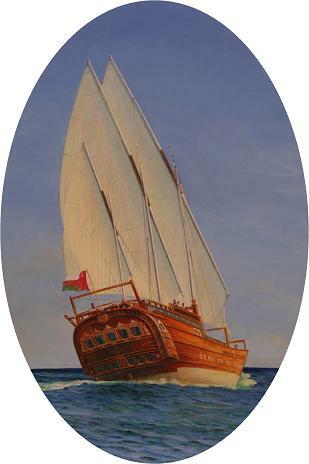 “Beauty of the Seas” is more than 4 times the size of working dhows although in spirit she echo’s their colourful past including her ornate stern, a feature the Arabs copied from early Portuguese voyagers. This picture was commissioned by the Government of Oman for the Sultan’s new yacht. We have another painting very similar in stock and for sale so here is your chance to own a painting fit for a King, make yours a royal household! Simply use the form below and ask about the other “Beauty of the Seas”.